Most people today rank super premium ice creams among their favorite indulgences. Now you need not visit the local ice cream parlor since you can make your favorite ice cream at home, fast and easy using Deni Ice Cream Maker. The ice cream makers are great additions to any home, especially if you enjoy the soft, cold treats. Today there are many models of ice cream makers such as the Deni Ice Cream Maker for making the best ice creams and desserts. While choosing an ice cream maker, you need to look for its features and the ease with which it can help you make your favorite ice cream. Make sure that the machine you choose has all the features you need and that it is easy to clean and maintain. With the proper usage of the ice cream maker, you will enjoy making a smooth, delicious ice cream to enjoy with your family and friends. Regular washing and proper maintenance of the ice cream maker such as Deni Ice Cream Maker ensure food safety and hygiene. What Are Deni Ice Cream Makers? Ice cream is one of the worlds' favorite comfort foods. You can make ice cream and desserts by using the ice cream mix with fruits, custard, wafers, chocolates, nuts, brownies, cheeses, and others to derive wonderful flavors. The biggest advantage of using an ice cream maker such as Deni Ice Cream Maker is that you can make healthy desserts whenever you want to. You may never know when guests will drop in. If you own an ice cream maker, you can entertain your guests with lip-smacking desserts like yogurt, sherbert, and sorbets, to name a few. Besides, you can take the machine to a party or wherever friends gather and amaze them with delicious ice creams. Cleaning and maintenance of the ice cream maker are so easy. You won't need to spend too much doing the utensils. 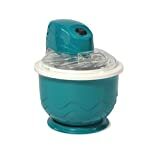 Deni Ice Cream Maker is a popular brand loved by all those who love ice cream. It comes in different models and colors such as Raspberry – Model 5202, Lime–Model 5203, Blueberry–Model 5201, Platinum–Model 5204, White–Model 5205. The Deni Ice Cream Maker is a freezer canister based machine. It comes with a hand-cranked compartment for grinding candies or nuts to add to your churning ice cream while it freezes. It has a 1.5-quart capacity. Like all freezer canister models, you have to store the main canister in your freezer at least for about 8 hours to freeze it. Then while making the ice cream mixture, you have to pre-chill it so that it maintains the required cold for making ice cream. Once everything is ready to go, you should pour in the ice cream mixture, and wait for about 30 minutes until the ice cream is frozen. Maker is one of the most affordable and efficient brands of the ice cream maker available today. It is always a good idea to read the directions for use that come with your machine. Even if you have used an ice cream maker before, it is still very important to go through the manual since the models may vary. By following the manufacturer's guidelines, you can keep your ice cream maker in top condition to enjoy perfect desserts every time. Make sure that the ingredients are properly chilled before you churning the machine. Pouring warm ice cream base into the machine can delay the cooling. This may affect the quality of the final product. To enjoy the smoothest textures of the ice cream, remember to refrigerate liquid before freezing. Also, freeze the canister ahead of time. If you love your ice cream with nuts, chocolate chips, or other kinds of mix-ins, add them as per the manufacturer's guidelines and avoid adding them too early. Avoid overfilling the ice cream maker. There should be air circulation during the churning process to give it that light, soft texture for the ice cream. To maintain hygiene, clean the machine thoroughly. Start by emptying and wiping any hardened ice cream off the scraping blades. Then flush with water until clear water comes out. The parts may be dismantled for washing. After washing with a mild detergent and warm water, dry the machine thoroughly with a clean towel. With proper care and maintenance of your Deni Ice Cream Maker, you can enjoy the best ice cream and desserts always. Four different models of Deni Ice Cream Maker compared here are of the price range from $ to $. The lowest-priced model was the Deni 1.5 Pint Automatic Ice Cream & Dessert sold on Amazon for about $. Two of the models were of the highest price namely Deni 5201 Fully Automatic 1-1/2-Quart Ice-Cream Maker with Candy Crusher and the Deni Ice Cream Maker 1.5 qt Automatic Ice. Both are sold on Amazon for $. The other machine compared was the Deni Model 5012 Automatic 1Quart Ice Cream maker sold on Amazon for about $. The Deni 1.5 Pint Automatic Ice Cream & Dessert is the best model of Deni Ice Cream Maker. With this machine, your can make delicious ice cream, frozen yogurt, sherbet, and sorbet. You can make your favorite item in as little as 30 minutes using this automatic dessert maker. While planning to make your dessert, freeze the canister one day before use. Pour in fresh or frozen ingredients, turn it on, and grab a spoon. This model can make about 1.5 pints of delicious ice cream that serves up to two persons. It is ETL-listed and fully automatic. It comes with dimensions of 8"H x 7-1/4" Diameter with a 5" base. Check if it is made of eco-friendly materials. Deni 1.5 qt. Automatic Ice Cream and Dessert Maker is a 1.5-qt automatic ice cream maker. With this machine, it is so simple to create your own delicious homemade ice cream within 30 minutes. It gives you the freedom to make your own concoctions. Make unique ice cream and desserts and entertain your family and friends. The operation is very simple. Just place the freezer bowl in the freezer the day before, then put the bowl in the unit. Turn the machine on, add the ingredients and get your favorite ice cream. You can even turn frozen fruit and other natural ingredients into yummy frozen yogurt, sherbet, or sorbet. Using the recipes, you can make homemade ice cream within 30 minutes. This model of Deni Ice Cream Maker is fully automatic for your convenience. With plastic/metal construction, it measures approximately 9"H x 7-3/4" diameter. It is ETL listed and durable. The Deni Model 5012 Automatic 1 Quart Ice Cream maker is designed to make delicious ice cream and dessert in a short period. This 1-quart automatic ice cream maker comes in attractive raspberry color. It is durable, easy for operation and, maintenance. With this machine, you can make your own delicious homemade ice cream to entertain your family and friends. With this model of Deni Ice Cream Maker, you are free to make your own concoctions and indulge. Follow the manufacturer's instructions and enjoy making the best ice cream and desserts. This fully automatic ice-cream maker comes with a powerful 40-watt motor. It can make up to 1-1/2-quarts in less than half an hour without using salt or ice. It comes with a canister that freezes in just 8 hours. The transparent lid, anti-slip rubber feet, and the cord storage make this model very convenient for use. The candy crusher dispenses cookies or candy into the ice cream. It comes with ice-cream recipes and 1-year limited warranty. It measures 10 x 9 x 14"
You won't have to visit the local ice cream parlor. With this Deni Ice Cream maker, you can make ice cream at home, fast and easy. Using the basic ingredients you can make delicious homemade ice cream in 10-20 minutes. When the ice cream making is almost complete, the candy crusher will grind up the ingredients with the turn of the handle, dispensing them into your ice cream. Crushed candy and ice cream have become a favorite frozen treat from ice cream parlors. Four different models of Deni Ice Cream Maker were compared. Their price range was $ to $. The lowest-priced model was the Deni 1.5 Pint Automatic Ice Cream & Dessert sold on Amazon for about $. Two of the models were of the highest price namely Deni 5201 Fully Automatic 1-1/2-Quart Ice-Cream Maker with Candy Crusher and the Deni Ice Cream Maker 1.5 qt Automatic Ice. Both are sold on Amazon for $. The other machine compared was Deni Model 5012 Automatic 1Quart Ice Cream maker sold on Amazon for about $. All the models of Deni Ice Cream Maker are designed to make ice cream and desserts with the least effort. The best part of having a personal ice cream maker such as Deni Ice Cream Maker is that you can design your own ice cream using your own recipe anytime you want. You can add your favorite ingredients and make the ice creams and desserts so unique to amaze your friends. This saves you the trouble of going around looking for your favorite flavor from an ice cream store. Also, you can design exotic varieties of desserts and ice creams by referring to recipes from various sources. Because of the convenience of making ice cream in your home in the flavor of your choice, the cost of the ice cream maker never is an issue. All the models compared here are affordable. Among the four models of Deni Ice Cream Maker compared here, the Deni 5201 Fully Automatic 1-1/2-Quart Ice-Cream Maker with Candy Crusher may be a preferable choice since it comes with an additional feature of candy crusher. With this, you can enrich the ice cream with your favorite candies and nuts.